Most people would agree that their household budgets have enough to cover and don’t need any extra expenses added to it. But if your insulation isn’t intact, if moisture has penetrated to the interior of your home or business, then you’ve already added a new item to your budget without even realizing it. That’s because the energy that you use to heat and cool the inside of your structure is escaping outside, increasing your energy bills, and you might not have figured out the reason why. Compromised insulation is one of the main reasons why energy consumption increases; it’s also one of the reasons why buildings experience issues that can, if not attended to promptly, lead to real problems later on. The right wall cladding can help provide the protection that your building must have if it’s going to be able to prevent moisture from invading your home or business. Weather has a lot of weapons at hand to defeat a building. Year after year, there are snowfalls, rainstorms, winds and hail; and don’t forget about the hot sun which beats down upon a building during the warmer months. Danpal wall cladding has a convective motion, with an air gap to provide natural ventilation, that keeps the insulation dry. Rain and snow are prevented from getting inside because of our connector-bound microcell polycarbonate sheets and our double-notching. How can a building hope to withstand such an onslaught from nature? Danpal has put a lot of research into its products and our wall cladding reflects the innovative spirit that marks all of our materials. Buildings have a vital role to play in the goal to maintain a sustainable lifestyle. In most IEA countries, it’s the buildings that consume 40% of primary energy. If your building’s insulation is allowing energy to escape, you’re the one paying the bill but the planet is paying the price for wasted energy. The purpose of insulation is to keep your energy within the structure so that you can maintain a consistent indoor temperature. But once insulation has been damaged by moisture, your heating and cooling systems have to work harder to maintain that consistent temperature. By protecting the insulation of a building, wall cladding is doing its part to help the building occupants support a sustainable lifestyle. The main purpose of wall cladding is, as we’ve noted, to protect the insulation of a building. But Danpal wall cladding, because our panels are customizable up to 12.0m standard length, offers a level of creativity and originality in architectural design that you can’t expect to find in other products. Customization is a fantastic benefit for architects because it allows them to indulge in more creativity with their designs. Add in the fact that Danpal wall cladding is available in so many colors and designs and it’s easy to understand how a building’s appearance is enhanced. Cladding is the skin of a building, designed to prevent outside weather from coming inside. Human skin conceals the arteries, blood vessels, bone and tissue that do the work of the physical body, and likewise, cladding presents a building’s attractive exterior rather than exposing the construction materials and spaces that are the inner workings of the structure. But there’s a difference: a little bit of rain or wind is okay for the body. That’s not the case for a building, which has to be constructed so that water and air remain outside where they belong. The DANPAL® VRS Ventilated Rainscreen System is our company’s weather protection for your building. What is the DANPAL® Ventilated Rainscreen System? DANPAL® VRS provides a full system to incorporate our Danpalon® panels so that you can be confident that your insulation is fully protected from the outside elements. The natural ventilation makes use of an air gap so that convective motion behind the panels keeps your insulation dry while maintaining its efficiency. What are the Benefits of the DANPAL® Ventilated Rainscreen System? First of all, DANPAL® VRS is 100% waterproof so the people inside don’t have to worry when thunder rumbles and rain pours down because weather’s place is outside, not inside. Installation is cost effective, easy, and quick. Once you’ve made the decision to select DANPAL® VRS, the rest is up to us to provide the worry-free installation. We have lots of colors and designs to choose from that will suit your building needs and your business image. Our standard panel length goes up to 12.0m, with longer lengths available upon request so that we can provide exactly what you’re looking for. The DANPAL® commitment to a sustainable environment lets your clients work in a building that seeks harmony with natural resources. What are the Main Features of the DANPAL® VRS? You know how critically important insulation is for your building. In most International Energy Agency (IEA) countries, buildings account for approximately 40% of the primary energy consumption. That level of usage means that efficiency is of primary concern. With DANPAL® VRS, you can count on our Danpalon®panel’s full protection of your insulation. The natural ventilation that’s a result of the air gap keeps insulation dry and efficient even as the years go by. DANPAL® VRS panels are double notched so that water can’t get in. Our Microcell polycarbonate panels are three times lighter than traditional rainscreen cladding. Easy Installation: Why is our installation so much simpler than what other companies offer? Our connections are made right on the support, so there’s no need for additional supporting framed structures. You’ve heard it said that beauty is only skin deep. Let’s rephrase that: beauty is only cladding deep. And in the case of cladding with DANPAL® VRS color options and design choices, beauty is a guaranteed feature of your building, thanks to our product’s visual appeal and quality. Our external wall cladding solutions offer protection and a strong aesthetic finish to your building’s exterior. Our designs not only look great, they also do the job of keeping your structure secure very well indeed. Wall cladding has to be able to stand up to the elements and keep out wind, rain and anything else that’s thrown at it. Our ventilated Rainscreen System does exactly that. You can find out more about it and its benefits below. Danpal external wall cladding complies with the relevant building regulation requirements, maintains insulation efficiency while providing an appealing exterior design to new or refurbished buildings. With connections made directly on the support, the external wall cladding does not need additional supporting framed structures. 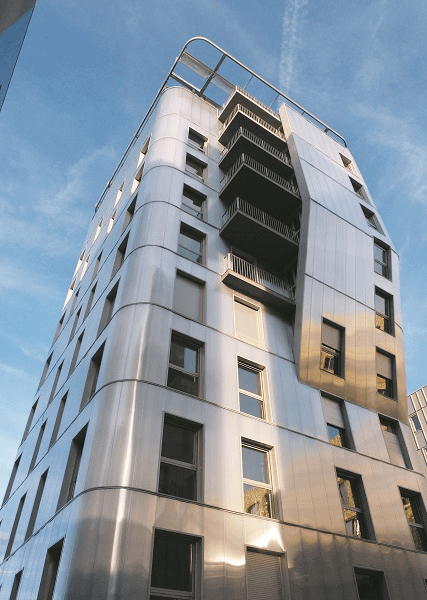 Up to three times lighter than traditional laminated cladding, Danpal external wall cladding uses the trusted Danpalon® connection system and can be installed on all types of supports. You can find out more about Danpal external wall cladding and its benefits below. 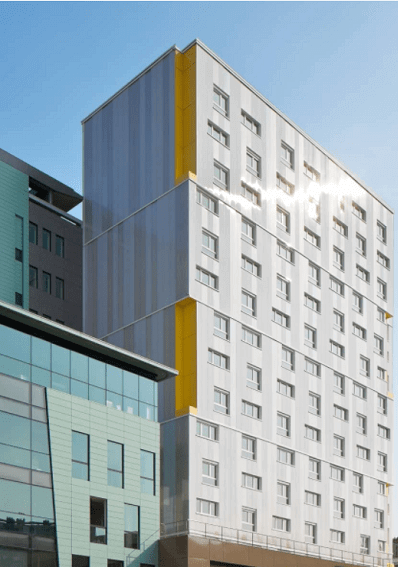 The Ventilated Rainscreen System we use is a complete system that incorporates Danpalon panels that help to protect and secure the building structure’s insulation. Because of an air gap, there is a convective motion behind the panels that keeps the insulation dry and efficient. So, with the aid of the Ventilated Rainscreen System, your building and its insulation can become even more environmentally friendly. The choice of designs and colours on offer mean that you can find a solution that looks great too. Insulation protection is the most important thing offered by our external wall cladding. When your insulation is kept protected, it remains free to do its job properly and keep your building as secure as it needs to be. There will be no wasted energy anymore. That’s something that is often the case with buildings that don’t have the right protection for their insulation. Don’t let this become a problem for your building because it doesn’t need to happen. Wasted energy means wasted money, and no one wants to be wasting money unnecessarily. Cladding always needs to offer protection from the elements, and the most problematic of these is the rain. If your building is fitted out with cladding that is not 100% watertight, you will run into problems before. Luckily, we offer external wall cladding solutions that are completely and perfectly watertight, meaning that leaks or even flooding will never have to concern you as you manage your building. This is allowed by the exclusive double notching of our Ventilated Rainscreen System wall panels. They’re designed to keep water out at all times. Simple installation is another thing that’s really important. The necessary connections are made directly onto the support. What this means is that there is never any need for extra supporting structures to be put in place when the external wall cladding is being installed. To put it simply, it makes the installation faster than any of the other wall cladding solutions you will find out there on the market at the moment. Before you know it, the job will be done, and the external wall cladding will be in place. For the last 50 years, we’ve been creating and installing innovative roofing systems and solutions for various architectural creations. Our company is the creator of roofing systems that offer optimal thermal and solar comfort. Today, we design, manufacture and distribute roofing solutions, such as skylights, roofs, facades and more, for a variety of applications.